Oh hey. I am here. Back from a fabulous fourth weekend. 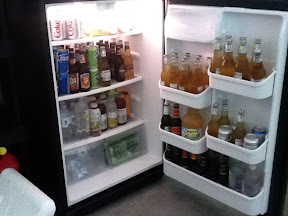 The fridge looked like this when we arrived at my parents lake house. I did not take an after pic. Trust me. We took care of it. We flew both ways without incident. Even had a bunch of people tell me yesterday how good my kids are and how they didn't know they were on the plane. Bragging. Yep. And speaking of bragging. For 90 solid minutes last night neighbors on all sides held their own private fireworks shows. Neither of my kids made a peep. Neither. But it turns out people do shop at those tents that pop up for a month every year. Our neighborhood kept them in business this year. We talked for weeks about Cannon going with Daddy and Doobie to see Cars 2. And despite hearing from other moms that it was violent and nothing like the first movie, we promised. Well. They got to the theater and a storm caused the roof to collapse. No movie. Probably a sign. I got some cute wedges. I actually went back to the store for them after thinking about them for a few weeks. Found the last pair in my size (they're 11's, be jealous) on the sale rack. Meant to be. Told my Mom and she said, ' are they comfortable?'. Irrelevant. They are five inch wedges. They are cute. I am not running marathons in them. One of my favorite times during the holiday weekend was a a very hot five mile run (fine, walked up the hills) with my husband. You know, the one I have seen for two days in the last six weeks? So fun. He is fun. And funny. And I love him. We visited a flea market near my parents lake house (rural Missouri... Like a whole hour outside a major US city) and I have never seen anything like it. And I have spent a lot of time in Walmarts across the midwest. Like a lot of time. I heard a guy saying to his wife/girlfriend/sister/mom (maybe all of the above) 'if they have those brass knuckles this time, I can buy them cause I got money now'. Cause if I was broke and then had money brass knuckles seems like the right thing to buy. If I had only had my camera. Oh my. It could have been amazing. Speaking of camera. Got some good ones this weekend and one of my faves I posted yesterday from the iPad looks crappy from the app. Remedied below. The only thing in my fridge is breast milk and beer. And string cheese. We are moving in a week. I am not good at shopping for only a few days. Speaking of moving. Major milestone should be complete by COB today. We will celebrate once it's done, mkay? Oh the unpacking and the packing and the madness. Bring it. Getting so close. The Best part? A wonderful relaxing weekend before the madness.